February 2019: New passenger vehicle registrations in Europe contracted by 1.3%. The Tesla Model 3 was the top-selling electric and premium midsize sedan. 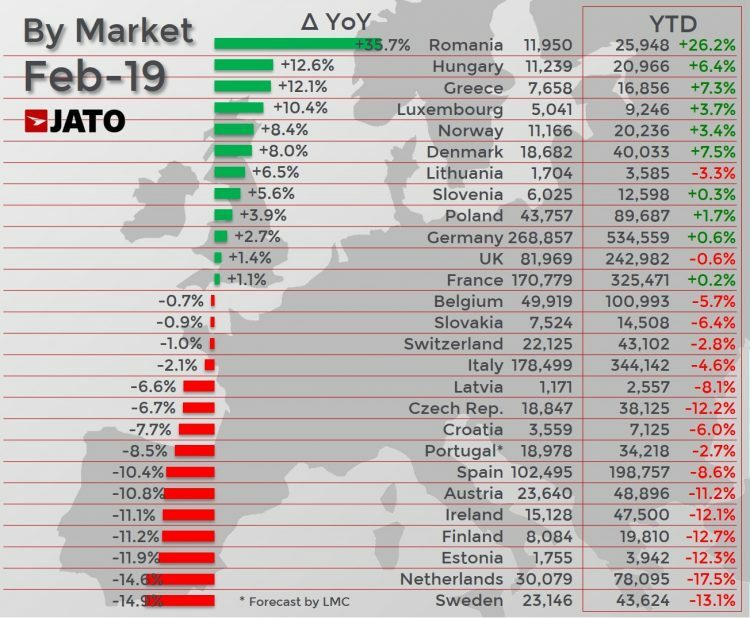 February 2019: the European new car market contracted for the sixth consecutive month but was weaker by a modest 1.3%. Volkswagen and Peugeot remained the two largest car brands in Europe and gained some market share. 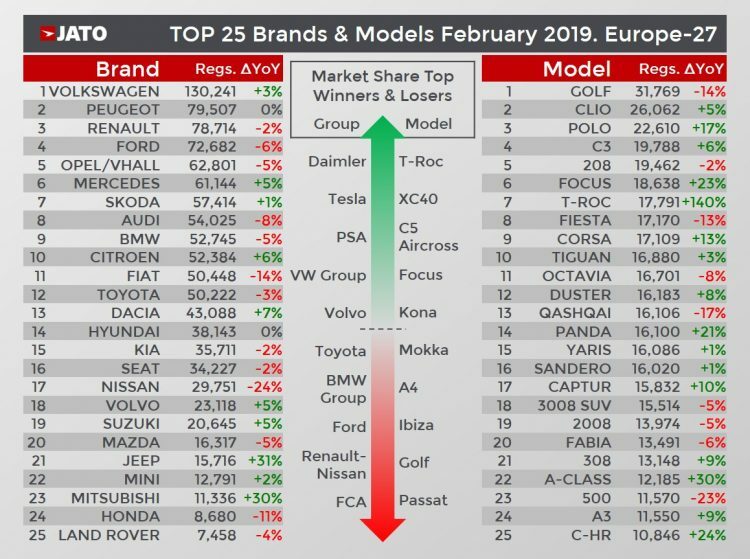 Sales of Ford, Opel, Audi, BMW and Fiat were sharply lower in Europe in February 2019. Electric car sales nearly doubled but market share remained at only 1.9%. The European car market registered its sixth consecutive month of decline in February 2019, as 1.14 million vehicles were registered. According to Jato, this was largely because February marked a month of uncertainty for many of the bigger European markets, such as Spain, where registrations fell by 10% amongst political turmoil, and the Netherlands, where a change in tax on pure electric vehicles contributed to the 15% drop in overall registrations. The Swedish and Finnish markets also saw declines of 15% and 11%, respectively, as the two countries continued to struggle to come to grips with the introduction of WLTP. Conversely, registrations were up by a huge 36% in Romania, due to the Government’s scrappage scheme in Q4-18, which led to an increase in vehicle deliveries in Q1-19. Denmark also recorded a strong result in February, with volume up by 8% due to an increase in its EV and PHEV registrations. This was mirrored in Norway, where nearly twice as many zero-emission cars were sold than in February 2018, and the Tesla Model 3 and VW e-Golf were the two best-selling cars. For Jato, the most notable result from February was the strong performance of pure electric vehicles (BEVs). Although their market share remained marginal at 1.9%, their volume increased by a huge 92% to 20,000 registrations. BEVs continued to gain traction in markets like Norway, where they counted for 40% of overall registrations, and the Netherlands, where they counted for 7%. Demand also increased by 81% in Germany, which was the largest market for BEVs in February. It’s also notable that most of the Model 3’s volume in February came from private registrations, which breaks the usual trend of a new vehicle’s volume being made up of business/fleet registrations. But even more remarkably, the Tesla Model 3 achieved another record in February, as it became the top-selling premium midsize sedan in Europe – outperforming the popular Mercedes C-Class, Audi A4 and BMW 3-Series. “As we’re seeing in the US, Tesla is also shaking up the European market. Its long-lasting impact will depend on how quickly the German premium makers, Volvo and JLR react to the arrival of the Model 3 to Europe and how quickly they can bring in their own midsize electric cars,” continued Munoz. Meanwhile, diesel registrations fell once again in February, although their market share did stabilise at 34%. This was due to an 8% increase in registrations in Germany, which helped to offset double-digit falls in Italy, France, Spain and the UK. SUVs, vans and sports cars were the only segments to grow during the month, as compact and midsize cars, and MPVs recorded large drops. Registrations of SUVs were up by 10% to 421,500 units, as they posted a market share of almost 37%. Small SUVs recorded 167,000 registrations, as demand increased by 13%, while compact SUVs saw 178,000 registrations and a 10% increase in demand. Volkswagen led the model rankings with the Golf, which saw a decline in its gasoline registrations (-18%), but an increase in its diesel registrations (+8%). The VW Golf 8 is to be launched only in 2020 – nearly a year later than previously expected due to development issues. 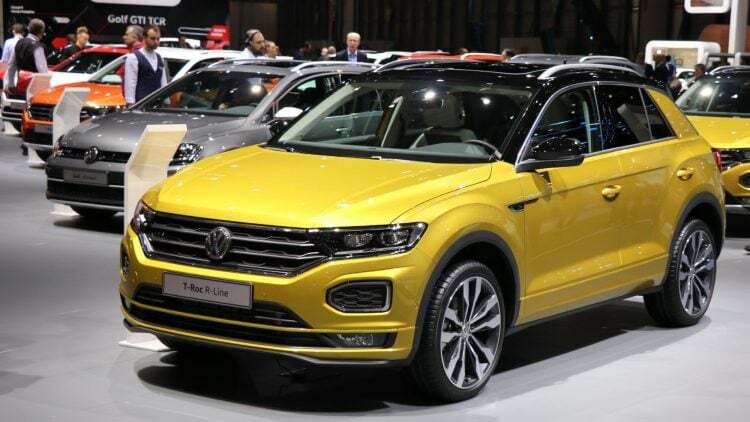 Meanwhile, the Volkswagen T-Roc climbed the rankings to become the best-selling SUV in Europe, outselling the Tiguan and Qashqai. It was the best performing SUV in Austria, Luxembourg and the Netherlands, and the second best in Germany, Croatia, Denmark and Italy. February was also a good month for the new generations of the Volkswagen Polo, which was Europe’s third best-selling car, and the Ford Focus, which was sixth. Elsewhere, the Opel Corsa hit the top 10 as its volume increased by 13%, despite its aging model. A new Corsa is expected later this year based on the new Peugeot 208 chassis. Among the latest arrivals, there were 3,810 registrations of the Citroen C5 Aircross; 3,657 of the Tesla Model 3; 3,190 of the Peugeot Rifter; 2,110 of the DS 7 Crossback; 1,684 of the VW Touareg; 1,458 of the Audi Q8; 1,368 of the Seat Tarraco; 951 of the Mercedes CLS; 891 of the Jaguar I-Pace; 712 of the Jeep Wrangler; and 431 of the Kia Proceed.